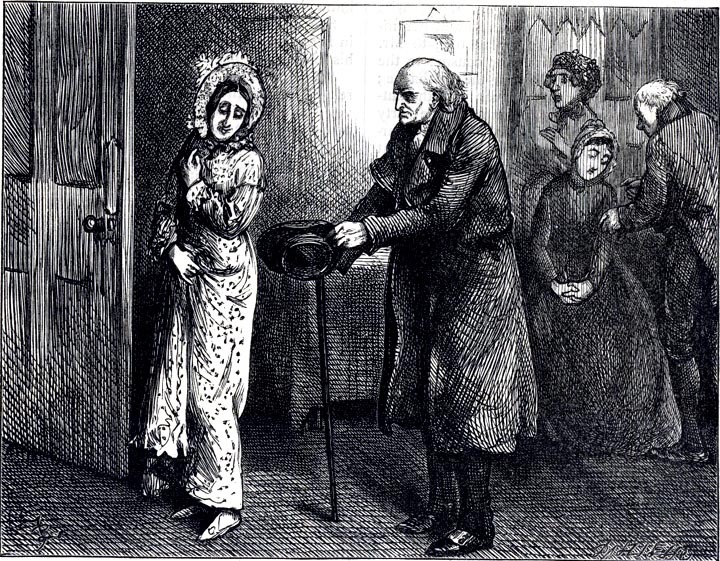 "Mrs. Todgers and Mr. Moddle" — twelfth illustration for "Martin Chuzzlewit" by Sol Eytinge, Jr. Image scan and text by Philip V. Allingham; formatting by George P. Landow. This was the only great change over and above the change which had fallen on the youngest gentleman. As for him, he more than corroborated the account of Mrs. Todgers; possessing greater sensibility than even she had given him credit for. He entertained some terrible notions of Destiny, among other matters, and talked much about people's 'Missions'; upon which he seemed to have some private information not generally attainable, as he knew it had been poor Merry's mission to crush him in the bud. He was very frail and tearful; for being aware that a shepherd's mission was to pipe to his flocks, and that a boatswain's mission was to pipe all hands, and that one man's mission was to be a paid piper, and another man's mission was to pay the piper, so he had got it into his head that his own peculiar mission was to pipe his eye. Which he did perpetually. He often informed Mrs. Todgers that the sun had set upon him; that the billows had rolled over him; that the car of Juggernaut had crushed him, and also that the deadly Upas tree of Java had blighted him. His name was Moddle. Towards this most unhappy Moddle, Miss Pecksniff conducted herself at first with distant haughtiness, being in no humour to be entertained with dirges in honour of her married sister. The poor young gentleman was additionally crushed by this, and remonstrated with Mrs. Todgers on the subject. "Even she turns from me, Mrs. Todgers," said Moddle. "Then why don't you try and be a little bit more cheerful, sir?" retorted Mrs Todgers. "Cheerful, Mrs Todgers! cheerful!' cried the youngest gentleman; "when she reminds me of days for ever fled, Mrs. Todgers!" "Then you had better avoid her for a short time, if she does,' said Mrs. Todgers, 'and come to know her again, by degrees. That's my advice." "But I can't avoid her," replied Moddle, "I haven't strength of mind to do it. Oh, Mrs. Todgers, if you knew what a comfort her nose is to me!" "Her nose, sir!" Mrs. Todgers cried. "Her profile, in general," said the youngest gentleman, "but particularly her nose. It's so like," — here he yielded to a burst of grief, — "it's so like hers who is Another's, Mrs. Todgers!" The observant matron did not fail to report this conversation to Charity, who laughed at the time, but treated Mr Moddle that very evening with increased consideration, and presented her side-face to him as much as possible. Mr. Moddle was not less sentimental than usual; was rather more so, if anything; but he sat and stared at her with glistening eyes, and seemed grateful. "Well, sir!" said the lady of the boarding-house next day. 'You held up your head last night. You're coming round, I think." Three illustrations of Todgers and Moddle. 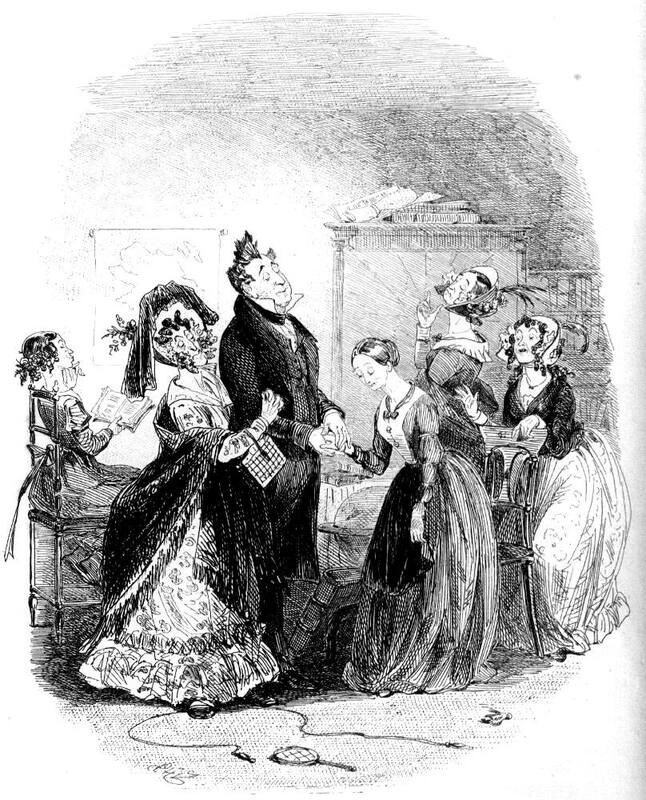 Left: Phiz's "Mrs. Todgers and the Pecksniffs Call Upon Miss Pinch" (April 1843). 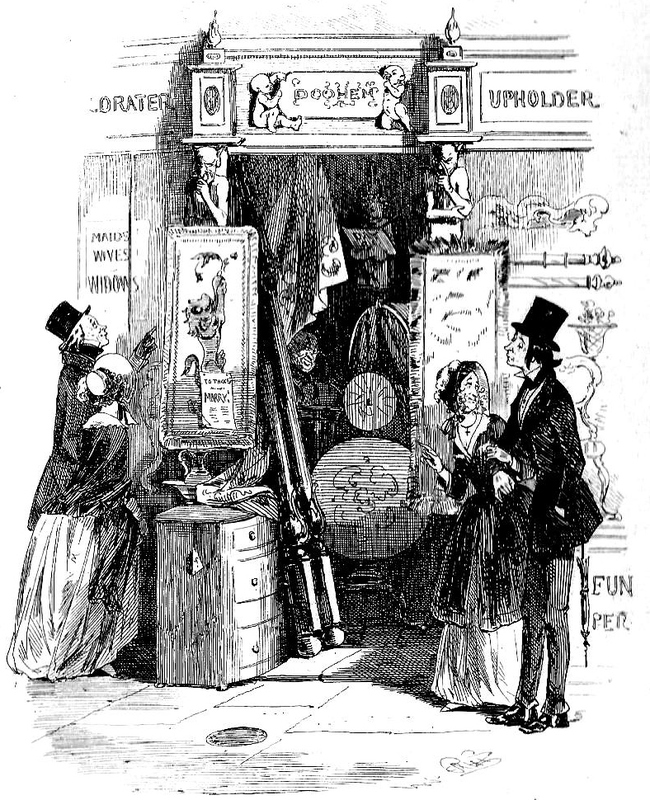 Centre: Phiz's "Mr. Moddle is Led to the Contemplation of his Destiny" (May 1844). Right: "Yes, sir" returned Miss Pecksniff, modestly. "I am — my dress is rather — really, Mrs. Todgers!" (Fred Barnard, Chapter 54, the Household Edition). 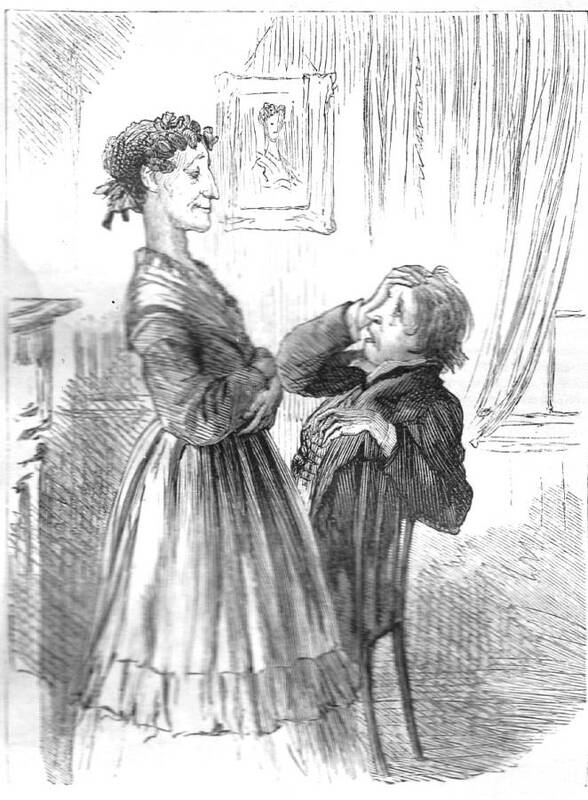 Whereas Eytinge thought the proprietress of the commercial boarding-house worthy of visual comment, Barnard relegates her to a corner of a single illustration late in the narrative in the 1872 Household Edition. Phiz, on the other hand, seems to have been content to let the reader imagine his appearance and manner resulting from his suffering from "a blighted heart" until well into the story, when in the May 1844 number he shows a pallid youth in respectable, middle-class garb accompanying Charity on a shopping expedition to set them up in housekeeping. Certainly in his twelfth illustration Eytinge captures Moddle's depressive state. Dickens, Charles. The Life and Adventures of Martin Chuzzlewit (1842-43). Il. Hablot Knight Browne ("Phiz"). London: Chapman and Hall, 1843. Dickens, Charles. The Life and Adventures of Martin Chuzzlewit. Il. Sol Eytinge, Jr. Engraved by A. V. S. Anthony. The Diamond Edition. Boston: Ticknor and Fields, 1867. Dickens, Charles. The Life and Adventures of Martin Chuzzlewit. Il. Fred Barnard. London: Chapman and Hall, 1872. Steig, Michael. Dickens and Phiz. Bloomington & London: Indiana U. P., 1978.